WWE Raw roundup: Who gained the advantage for the Money in the Bank Ladder Match? 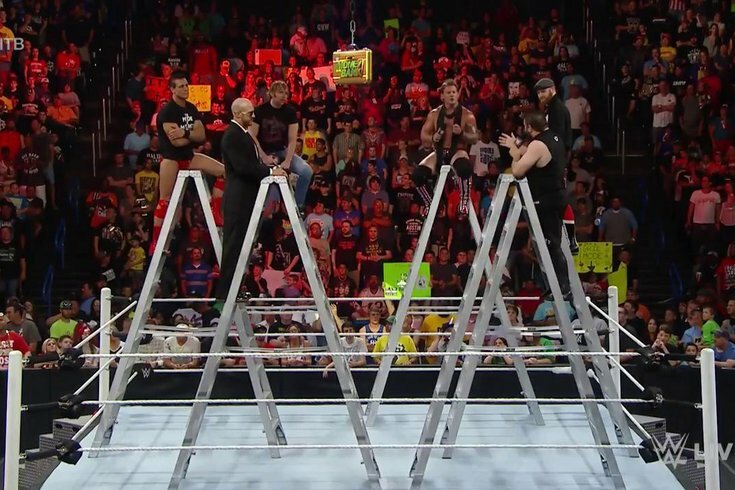 The Money in the Bank participants took part in a sort of ladder roundtable to kick off Raw on Monday. Some huge news broke this weekend about Brock Lesnar returning to the octagon for UFC’s next pay-per-view in July. On ESPN Monday morning, Lesnar announced he’ll be fighting Mark Hunt at UFC 200 on July 9th. Lesnar reportedly training for an MMA return since the day after WrestleMania, WWE will get a ton of press out of this and a great month-long promo for SummerSlam in August. With that news at the forefront of MMA and pro wrestling fans alike, WWE presented Raw on Monday night from the Chesapeake Energy Arena in Oklahoma City. Surprisingly, WWE didn’t promote Lesnar’s fight that much on-air as it did on social media, but I’d expect that to change. The WWE pay-per-view is on the 19th, so they’ll have time to advertise it on Raw and SmackDown. But on Monday night, everyone was focused on the Money in the Bank Ladder Match participants, AJ Styles and John Cena. A couple of video packages featuring Seth Rollins and Roman Reigns also stole the show Monday night. WWE also paid tribute to Muhammad Ali with this video package. Who’s got the edge heading into the Money in the Bank Ladder Match? The program began with an introduction for Dean Ambrose, who are set to join a sort of silly situation with all the participants in the Money in the Bank Ladder Match. All of them – Cesaro, Sami Zayn, Chris Jericho, Kevin Owens along with Ambrose – were perched high on respective ladders basically talking smack to one another. One of the better parts was when Jericho says Money in the Bank is his match [in storyline, the concept was his idea dating back to 2005], and the other participants point out that Jericho has never won the match despite being in it numerous times. I wasn’t exactly a fan of this promo. The visual didn’t do much for me in terms of making me want to see the match right away. Teddy Long made his triumphant return for a hot second to throw his name in the hat to run SmackDown. Stephanie then came out and sent the former SmackDown general manager on his way and made three huge matches for the night – Cesaro vs. Jericho, Zayn vs. Del Rio and Ambrose vs. Owens. Cesaro would get the win against Jericho by utilizing The Sharpshooter to make him tap out. Del Rio defeated Zayn after a double stomp in the corner. Ambrose pinned Owens clean in the ring after hitting him with Dirty Deeds. John Cena showed some fire in his promo when he called out AJ Styles to answer for his actions last week in turning on Cena and having The Club completely dominate him. Styles obliged, but he was with his buddies Luke Gallows and Karl Anderson, and the trio decided to stay on the stage A fierce war of words between Styles and Cena probably left the “smark” wrestling fan grinning from ear-to-ear. Styles using terms like Cena “burying” guys like him has already made this feud just as good, if not better, than the Rollins-Reigns feud. Styles and his boys then stalked to the ring, but Cena wasn’t going anywhere. When The Club was set to attack, the WWE World Tag Team Champions came out to save Cena and challenge The Club themselves. Styles and co. backed down. Something to take from that Styles-Cena promo? We’re in for a hell of a feud, and they’re just getting started. That led to the main event. The Club took on The New Day and before the match officially started, Styles laid out Xavier Woods with a Styles Clash on the outside of the ring, sending him to the locker room during a commercial break. It then became a 3-on-2 handicap match with Styles, Anderson and Gallows taking on Big E and Kofi Kingston. Styles got the win for his team after hitting Kingston with the Phenomenal Forearm, and then The Club beat down Big E and Kofi before Cena’s music hit and he came down for the save. Styles was able to hit him from behind after he took out Gallows and Anderson. Kingston and Big E eventually evened the odds and the champions and Cena ended Raw standing tall in the ring. Speaking of the Rollins-Reigns feud, WWE opted to go with the two video packages to build to Money in the Bank’s main event for the WWE World Heavyweight Championship. First, WWE highlighted Rollins’ road back to the ring after suffering a torn ACL, with much of the footage being from their WWE 24 special on WWE Network last Monday. I’m not sure how one can look at that video and not pull for Rollins. On the contrary, I’m not sure how one can look at this video of Reigns and cheer for him. It looks like WWE is doing things backward – it wants the people to boo Rollins and cheer Reigns. These video packages produce the opposite effect. Maybe a double turn is coming? Next Monday night, both Rollins and Reigns will be guests on The Ambrose Asylum hosted by their ex-Shield teammate. Now that’s going to be must-see TV. Charlotte came out and apologized for banishing her father, Ric, from her life. The Women’s Champion said that when she told Ric he was dead to her, she only meant professionally, she didn’t mean it personally. I honestly had to rewind the television to make sure I heard her right. That came out of absolutely nowhere. There’s no reason for Charlotte to apologize to her father during this pro wrestling angle. It didn’t make one bit of sense, but maybe that’s what WWE was going for. Maybe that was their way of trying to make Charlotte seem like the sleazy heel that her father often was. I might almost buy that. But if Charlotte wants to truly make an impact right now, apologizing to Ric isn’t the way to go about it. Whoever thought that was a good idea was sadly mistaken. Natalya and Becky Lynch came out to try and call Charlotte on her nonsense, almost convincing Dana Brooke at how fake her friend was. Brooke teased turning her back on Charlotte before attacking Natalya, leading to her and Charlotte leaving Natalya and Lynch lying in the ring. Enzo and Cass on the path to glory? Enzo Amore and Big Cass are quickly becoming one of the most popular acts in WWE if they aren’t already. Monday night, the duo took on The Vaudevillains in a rematch of Payback back in May when Amore sustained a concussion from a botched move. Well, they would reenact that same move that took out Amore, but this time, he was able to duck the rope and fall to the outside without getting seriously injured. Of course, WWE played it up like it was the same exact thing that happened, and Big Cass went absolutely nuts, causing a disqualification after not listening to the referee. Some think with how well Big Cass has performed in Amore’s absence that the tag team will be broken up sooner than anticipated with the upcoming brand split. That absolutely must not happen. While they’re a great act, they’re far from engrained in WWE enough to where they can afford to split them right now. Hell, The New Day isn’t even in a position to be split just yet. If they split up Enzo and Cass right now, I’m not sure either of them can survive on their own. This week, life coach Bob Backlund stole Darren Young’s car keys. •	Cesaro d. Chris Jericho by submission via The Sharpshooter. •	Non-Title: Rusev (c-US) d. Jack Swagger by countout after Rusev threw Swagger into Titus O’Neil, who was doing commentary, and beating the count. •	The Vaudevillains d. Enzo Amore and Big Cass by disqualification after Cass wouldn’t stop attacking Aiden English in the corner after he threw Amore to the outside. •	Alberto Del Rio d. Sami Zayn by pinfall via the Double Stomp. •	Dean Ambrose d. Kevin Owens by pinfall via Dirty Deeds. •	Tyler Breeze w/ Fandango vs. R-Truth w/ Goldust resulted in a No Contest since both teams began brawling before the match even began. •	3-on-2 Handicap Match: The Club d. The New Day after Styles hit Kingston with the Phenomenal Forearm.